1) H.M. Talal, King of the Hashimite Kingdom of the Jordan (s/o Queen Musbah) - see below. (1) H.R.H. 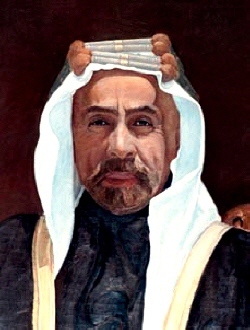 Prince Hamzah al-Abbas. b. at Amman, 17th April 2007. (1) H.R.H. Princess Karma al-Abbas. b. 2003.
ii) H.R.H. 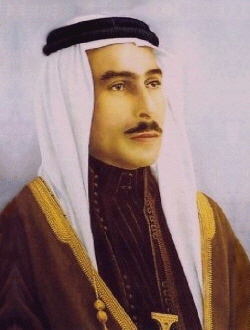 Prince Ja’afar bin Ali. b. at Amman, 27th April 2007 (s/o Reema). i) H.R.H. Princess Na’afa bint ‘Ali. b. 27th December 1966 (d/o Wijdan). Mngr Al-Kutaifa Estate. ii) H.R.H. Princess Rajwa bint ‘Ali. b. 29th June 1968 (d/o Wijdan). Artist and sculptor. Hon Presdt Balqa Plastic Arts Soc. Mbr Brd of Trustees National Gallery of Fine Arts. iii) Major H.R.H. Princess Basma Fatima bint ‘Ali. b. 24th March 1970 (d/o Wijdan), educ. RMA Sandhurst, and Woods Hole Oceanographic Inst, Massachusetts, USA. Cmsnd as 2nd-Lieut Jordan Arab Army, prom Maj, head of the Human Resources Dvsn. Chair Jordan Royal Ecological Diving Soc (JREDS) since 1993, National Environment and Wildlife Soc (NEWS) since 1996, Jordanian Hashemite Fund for Human Dvpt and the Red Crescent Soc. Co-Chair Royal Marine Conservation Soc of Jordan (JREDS). Hon Presdt Fertile Crescent Soc of the Middle East, and the Planetary Coral Reef Foundn (California, USA). Founder and Presdt Royal Botanical Garden at Tel Al Rumman, and Pilot Phase Assessment Ctee of Jordan for the Global Environmental Facility. Dir Halfway House for Juvenile Delinquents (Boston, USA). Mbr Soc for the Preservation of Jordanian Heritage, RAC of Jordan, etc. Rcvd: Al-Hussein Order of Merit 4th class (1998), King Hussein Gold Medal for Excellence, and the Medal for Administrative Competence (1995). m. at Amman, 2004, Amjad Farrah (b. 17th January 1967), motor rally driver with the Orion World (HKJ) racing team since 1988, Jordanian International Rally Champion and winner of the FIA Middle East Championship for Drivers 2004.
i) H.R.H. Prince Nayef bin Asem. b. at Amman, 22nd January 1998 (s/o Sana’a). (1) Hamzah Basel Yaghnam. b. at Boston, Massachusetts, USA, 28th April 2008. (2) Kiyan Basel Yaghnam. b. at Amman, 22nd June 2009. (1) Talal Alejandro Garrido Asem. b. at Madrid, Spain, December 2008. (1) Lola Alejandra Garrido Asem. b. December 2010.
iii) H.R.H. Princess Noor bint Asem. b. at Amman, 6th October 1982 (d/o Firouzeh), educ. King’s Coll, Madrid, Spain, and Emerson Coll, Boston, Massachusetts, USA. Attaché at the Jordanian Embassy in Madrid since 2010. Rcvd: GC of the Orders of the Star of Jordan, and the Orange-Nassau of the Netherlands (30.10.2006). m. at al-Baraka Palace, Amman, 29th August 2003 (nikah) and at the Zahran Palace, Amman, 27th May 2004 (zifaf) (div. 9th September 2009), Lieutenant-Colonel H.R.H. Prince Hamzah bin al-Hussein (b. at Amman, 29th March 1980), fourth son of H.M. Hussein I, by the help of God, King of the Hashimite Kingdom of Jordan, GCB, GCVO, GCStJ, Royal Victorian Chain, by his fourth wife, H.M. Queen Noor al-Hussein, GCStJ, daughter of Najeeb Elias Halaby. She had issue, one daughter - see below. (1) Hashim Haj-Hassan. b. 2012. (1) Aisha Haj-Hassan. b. 27th May 2013.
v) H.R.H. Princess Nejla bint Asem. b. at Amman, 9th May 1988 (d/o Sana’a), educ. Amman Baccalaureate Sch, Amman, Middlesex Univ, Dubai, and Goldsmiths’ Coll, London. m. at Amman, 12th June 2014 (nikah) 23rd October 2014 (zifaf), Nasser Osama Talhouni, son of Dr Osama Mohammed Yassine Talhouni, sometime Chair Union of Grain Millers Co-operative and Presdt Jordanian-Russian Friendship Soc. 1) H.R.H. Princess Haya. b. at Constantinople, Turkey, 1907 (d/o Queen Musbah). m. at Amman, 10th June 1943, H.H. Prince ‘Abdu’l-Karim Ja’afar Zeid Dhaoui (b. 1914), sometime Senator of the Kingdom of Jordan, son of Sharif Ja’afar bin ‘Ali Jabbar Zeid Dhaoui, by his wife, Hatija [Khadija], daughter of Muhi ud-din. She d. at Amman, 1990 (bur. Royal Mausoleum, Raghdan Palace, Amman) - see Hijaz. 2) H.R.H. Princess Munira. b. at Mecca, Arabia, 1915 (d/o Queen Musbah). She d. unm. at Amman, 1987 (bur. Royal Mausoleum, Raghdan Palace, Amman). 3) H.R.H. Princess Maqbula. b. at Mecca, Arabia, 6th February 1921 (d/o Princess Suzdil). m. at Amman, 1943, H.H. Prince Hussein bin Nasser Bey, GCVO (b. at Taif, Arabia, 30th November 1902; d. at Amman, 1st May 1982, bur. Royal Mausoleum, Raghdan Palace, Amman), sometime Prime Minister, Lord Chamberlain and Minister of the Royal Court, sixth son of H.H. Prince Nasser bin ‘Ali Pasha, sometime Deputy Grand Sharif of Mecca, by his second wife, Perendis Khanum. She d. at Amman, 1st January 2001 (bur. Royal Mausoleum, Raghdan Palace, Amman), having had issue, one son and one daughter - see Hijaz. 1) H.M. King Hussein, King of Jordan - see below. ii) H.H. Prince Muhammad bin Talal. b. 2001 (twin with his sister Rajaa). iii) H.H. Princess Rajaa bint Talal. b. 2001 (twin with her brother Muhammad). i) H.H. Prince ‘Abdu’llah bin Ghazi. b. at Amman, 6th November 2001.
i) H.H. Princess Tasneem bint Ghazi. b. at Amman, 27th August 1999, educ. The School for Life, Amman. ii) H.H. Princess Jennah bint Ghazi. b. at Amman, 20th September 2003.
i) Arif al-Batayneh. b. at Amman, 15th February 2006.
i) Tariq Judeh. b. at London, 1994 (twin with his sister Zein). ii) ‘Ali Judeh. b. 1996.
i) Zein al-Sharaf Judeh. b. at London, 1994 (twin with her brother Tariq). c) H.R.H. Princess Badiya El Hassan. b. at Amman, 28th March 1974, educ. International Baccalaureate Sch, Amman, Sherborne Sch, Dorset, Christ Church, Oxford (BA Hons), Coll of Law (dipl. ), Lincoln’s Inn and the London Sch of Economics (LSE), London (LL.M.). Barr-at-Law 1998, worked at the UNO in New York and Geneva. Patron The Oxonian Soc. Mbr UK Brd of Africa & Middle East Refugee Assistance (AMERA), etc. m. at Beit al-Amir al-Hassan, Amman, 22nd September 2004 (nikah) at 24th June 2005 (zifaf), Khalid Edward McCall Blair (b. at London, 1974), educ. Eton and Bristol Univ, Barr-at-Law (Lincoln’s Inn), son of Douglas Blair, QC, by his wife, Diana, née Holding-Parsons. 4) H.R.H. Prince Muhsin bin Talal. He d. young. 1) H.R.H. Princess Asma bint Talal. b. and d. at Al-Qasr Al-Sagheer Palace, Amman, 1937.
a) Ghazi al-Daghistani. b. at Amman, 21st July 1974, educ. RMA, Sandhurst. m. at Amman, 19th June 2006 (nikah) and 7th September 2006 (zifaf), Samanta al-Daghistani, daughter of Sayyid Mahdi Saifi, of Amman, Jordan, originally from Nablus, Palestine. b) Sa’ad al-Kurdi. b. at Amman, 8th November 1982.
b) Zein al-Sharaf al-Kurdi. b. at Amman, 1st June 1986.